Aside from possibly Romance, I can’t think of a single genre that bores me quite as much as Western. Cowboys on horseback, grimy saloons, sun-bleached deserts…pretty much everything that makes the Western genre unique and romantic simply puts me to sleep. However, after watching “3:10 to Yuma” I have decided to completely rethink my opinion on Westerns. “3:10 to Yuma” was hands down one of the most outstanding pictures I’ve seen all year and a real surprise to me, someone who admittedly avoids the Western genre like the plague. Life isn’t easy for homesteaders out in the Old West. No one knows this better than Dan Evans (Christian Bale) and his family, who are about to be kicked off their land if they can’t pay their debts. Then in rides Ben Wade (Russell Crowe) and his gang of outlaws who, after a stagecoach robbery, wind up fleeing the town and leaving their boss behind. Wade is to be taken a few towns over to ride the 3:10 to Yuma prison and Evans takes the job escorting him there in order to save his land. The trek won’t be easy, with obstacles such as Wade’s gang, Indians and Ben Wade-himself getting in the way. I wasn’t originally planning to see this movie this month, but the choice came down to either “3:10 to Yuma” or “Dragon Wars” and so I chose what I figured to be the lesser of two evils. I am extremely pleased with my choice, as “3:10 to Yuma” proved to be one of the more exciting, well-scripted and well-cast films I’ve sat through all year, Western be damned. As I found out only recently, it’s actually a remake of a 1957 film that I’d never heard of, so I won’t be able to draw any comparisons between the two for you or say which one is “better”. All I can tell you is that this is a fantastic flick which you’d be wise to check out, whether you enjoy Westerns or not. Christian Bale has really been hitting a string of bullseyes for the past few years, with this movie just being his next direct hit. He makes Dan Evans out to be a truly complex and endearing hero that compliments Russell Crowe’s “lovable villain” quite nicely. Crowe, as we already know, is a fine actor and delivers another stellar performance as Ben Wade. I’m the kind of guy who typically prefers villains over heroes since they’re always more fun. Crowe’s Wade really makes the movie, as he both helps and hinders his captors all throughout the film, doing devilish things but in such a charming manner you just can’t hate him for it. I may not be an expert on Westerns, but from my experience I’ve come to understand that what the audience is really waiting for is the “showdown” at the end. Evans and Wade’s run for the train at the end is mesmerizing, keeping you with that “are they gonna make it?” voice yammering on in your head the whole way. And the ending is absolutely perfect. As someone who unashamedly dislikes Westerns, even I can’t pretend for a second that this wasn’t a fantastic movie. It’s got a great cast (I only mentioned the two headliners, but there are plenty more in here to impress you) and an enthralling story. I have a good feeling you’ll want to see this movie even if you don’t want to see this movie. 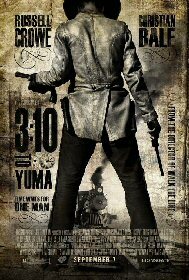 I would recommend that you watch Tombstone if you liked “3:10 to Yuma”. It’s just as good. I can identify with your dodging the western like a plague, I feel the same with all the science fiction and horrors. Have you never watched Lonesome Dove, Silverado, Dances With Wolves, The Unforgiven, Tombstone, Wyatt Earp, Quigley Down Under, The Missing? I am looking for a sound effect or song that has the the show down whistle and music “whistle dum dum dum whistle dum dum dum” anyone no the name or where I can find it?